Bearded irises are big, bold, beautiful plants that live for many years with minimum maintenance. 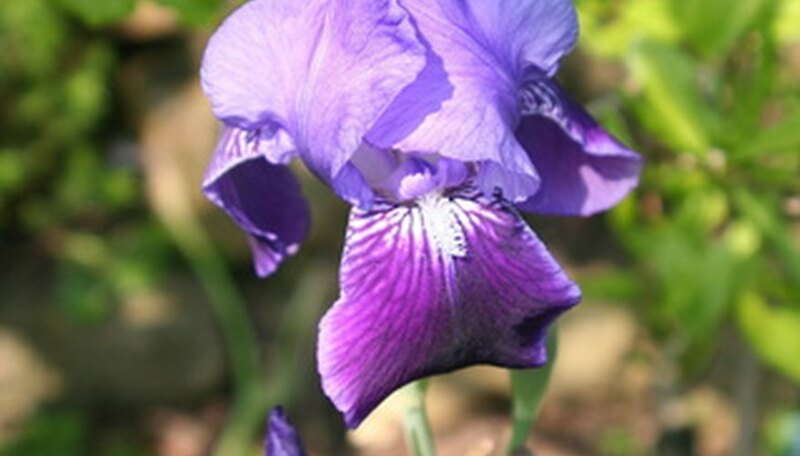 Most bearded irises bloom in spring, but some varieties re-bloom in summer and autumn. The showy blooms are available in a range of hues, including purple, pink, blue, red, white and yellow. The bearded iris grows from fleshy tubers or rhizomes, which keep the plant well supplied with nutrients and moisture. The bearded iris does well in pots, and is available in dwarf and miniature varieties that are especially suited to container growing. Choose a sturdy container with a minimum diameter of 12 inches. Be sure the container has at least one drainage hole in the bottom. Fill the container with a general purpose commercial potting soil. Plant the bearded iris rhizomes in the container, with the top third of the rhizome poking above the soil. If you live in a hot climate, plant the rhizome slightly deeper, covering it with 1/2 inch of soil so it won't sunburn. The number of bulbs you can plant depends on the size of the container, but allow about 6 inches between each rhizome, and 2 inches between a rhizome and the edge of the container. Water the bearded iris deeply after planting, and continue to water regularly throughout the season until at least a month after the blooms have wilted. Plenty of moisture will keep the rhizomes healthy for the next growing season. Remove the spent blooms and stems at the end of the growing season, but leave the sword-like leaves in place. The foliage will supply nutrients to the rhizomes for the next year's blooms. Move the container to a protected area during the winter, especially during the first winter after planting. A layer of mulch such as straw or leaves will also protect the iris, but be sure to remove the mulch as soon as the weather warms in spring, as mulch can attract rodents and pests. After the first year, the bearded iris will be established and able to survive winter without protection. Divide bearded iris every three to five years, or whenever the container gets too crowded. Lift the rhizomes from the container with a trowel, then use your fingers to separate the clump into smaller groups of rhizomes. Rinse the rhizomes so you can see better, then cut off any sections that are soft, brown or rotted. Replant part of the rhizomes in the container and reserve some for a new container, or share them with friends. How Do I Store Iris Bulbs Over the Winter?